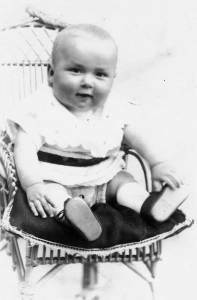 Mother was born in Ydby, a village in Thy, north-west Jutland, on January 2, 1902, and was thus six months younger than Dad. In 1905 the family moved to Thisted, a small incorporated town on the Limfjord. There she started school at the age of seven. She loved reading, singing and Bible stories. The story of the Bible was part of the curriculum, along with hymns and patriotic songs. She remembered with affection a teacher in Thisted who accompanied the singing on his violin. In 1911 however Bedstefar lost his steady job in Thisted and for the next seven years the family was rootless, moving frequently and staying in one place for only a few months or a year or two. In the villages where they lived the opportunities for education were poorer than in Thisted and Mother’s thirst for knowledge went unsatisfied. She took German for one year in Thisted; it was not taught in the rural villages. There were no “mellemskoler” in the villages, so she was unable to take secondary education as Peter had done earlier in Thisted and Axel was to do later in Skive. At the crucial time the family lived in the village of Hurup, where there was no schooling beyond age 14. When Mother was twelve she became a wage earner, first by making deliveries for a baker and later by doing housework for an elderly lady and minding a little girl after school. She remembered her confirmation in Hurup by the Methodist minister in 1916. Her father was in hospital in Vestervig with acute appendicitis, it was not known whether he would survive and the family was dependent on charity. 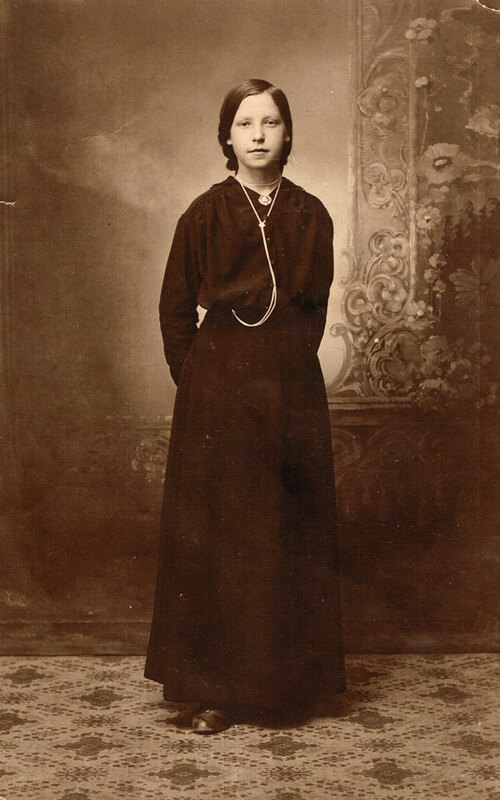 Her cousins in Copenhagen wore white confirmation dresses, but she had to be content with a black one; the only material her mother had available. A relative whom she disliked, a son of P-Povlsen’s half-brother, offered to buy her a pair of boots, but she spurned his attention and refused to accept help from him, choosing instead to wear an old pair of shoes borrowed from a friend of her mothers. A picture taken at the time shows a very strong-willed young lady indeed. I can imagine her fighting back the tears and steeling herself to go forward. In 1917 the Spanish ‘flu struck Denmark, and everyone in the family except Mother was sick at the same time. She was “out earning” and wanted to go home and look after the family but her employers would not agree as they feared she would carry the disease back to them. On another occasion Lydia and Axel came down with scarlet fever and were taken to hospital in Vestervig. Mother, as the oldest girl, worried about the family and felt she should be home with them at such times. In 1918 the Birkholms moved to Skive, and Mother with them. There she did housework for a year. Following that she was accepted for the nursing program at a tuberculosis sanitarium in Holstebro. She liked nursing and stayed for about six months, but lacked the physical strength to continue. For about a year she worked in a factory in Skive, making paper bags; Lydia worked for the same employer and they were happy in their job. In Skive Mother and Lydia joined the Salvation Army. Mother spent the winter of 1921-22 at Cadet School in Copenhagen (where she had more opportunities for singing and Bible study), and was commissioned as an officer and stationed in Skagen, a small town at the northern tip of Jutland. She loved Skagen, with its heather and windswept sand; in subsequent years it became the home of an artist colony. But again her health failed her. After a summer spent delivering Krigsråbet (The Warcry) and the other duties of a junior Sally Ann officer her feet gave out and she was taken to hospital in Skive. Soon she was back in the factory where she could do her work in a sitting position. I believe Mor as a child used second-hand shoes. This was probably the cause of the foot problems she had in later life. The Birkholm family had not learned to brush their teeth, and Mar got her first set of dentures when she was about 20. 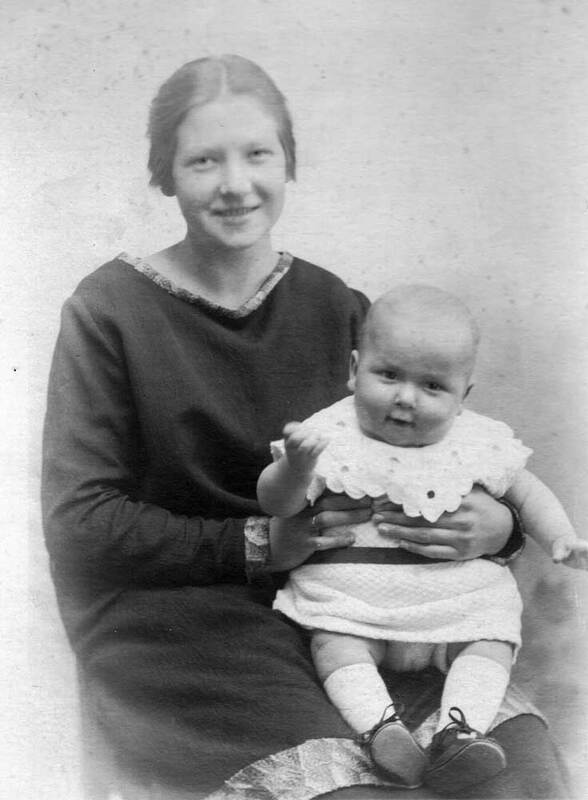 It was early in 1923 that Mother and Dad met. He was living in Holstebro and assisting Pastor Carl Bjerno with his extensive circuit. Dad’s duties took him to Skive and he was paying his first visit to the Birkholms when Mother came into the living room with her hair down her back, not knowing that there was a visitor there. Dad was a charmer, and before long he and Mother and Lydia were taking walks in the park. Lydia soon sensed the way the wind was blowing and bowed out. 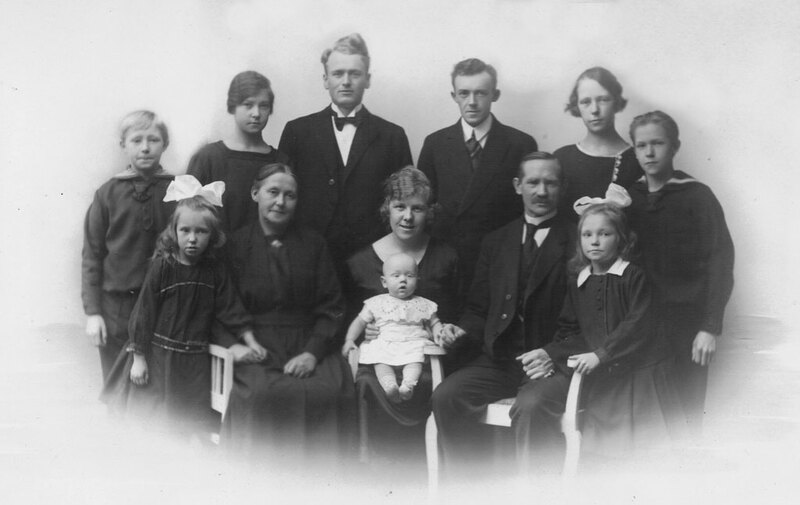 During summer 1923 Dad was moved to Fåborg where he conducted services for the small congregation and lived in two rooms in the church building. He sought out Mother’s grandmother, who was 82 and blind. In early December the Birkholm family heard that Fru Birkholm had died, and appointed Mother to represent them at the funeral. She sent Dad a postcard stating the time of the service, announcing her arrival, and asking him to purchase flowers for the family. Mother spent the night with Dad in his apartment at the church, and the (almost) inevitable happened. After returning to Skive she was beset by worries and soon thought she was pregnant. She shared her concerns with her parents, and the local minister, Berger Pedersen, was consulted. It was a serious matter as Dad was bound for the ministry, and Pedersen mounted his motorbike and met with the District Superintendent in Århus. Nothing for it, but Dad had to resign as a candidate for the ministry. It turned out that Mar was not pregnant after all. Probably her anxiety and guilt feelings had disturbed her menstrual cycle. But the damage had been done, and Dad’s path to the ministry had been cut off forever. He left Fåborg in July, 1924. If Mother had been pregnant he would have had to find a better paying job in order to support her, regardless of the official attitude of the church. Dad tried to tell me the story many years ago, but did not express himself clearly and I misunderstood. We often had difficulty communicating. After Dad died Mother gave me the details. She blamed herself and told me they were no better than other young people. Mother had ambition, determination and ability, but with her history of poverty and health problems and her abortive attempts to make a career for herself, she had little opportunity to develop the self-esteem and self-confidence which her intelligence and competence warranted. She had run out of career options and needed a strong arm to lean on. She found the strong arm in Dad. He had great ideals, presence of mind and strength of character, he was well organized and able to make up his mind quickly; he could make full use of his physical and mental abilities. Mother added sensitivity, understanding and tolerance, qualities needed for a supporting role. Another void in Dad’s life was the ability to spell. Mother was a good speller, first in Danish and later in English. 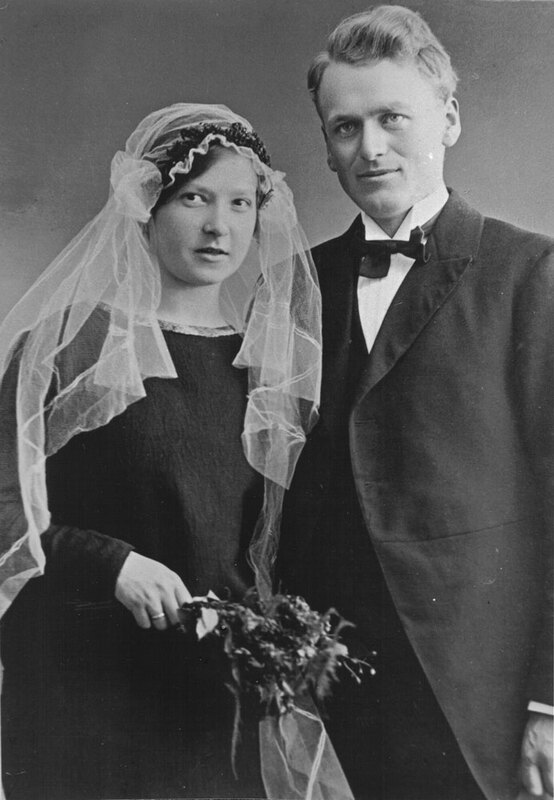 My parents were married in Bethel Chapel, Skive, on May 3, 1925. A fish dealer in the congregation gave them a mess of flounders, and that constituted their wedding dinner. Dad had been living in one room in Kjellerup, and now Mother moved in with him. They had a bed, a gas stove, a shelf and not much else. Luxuries were few. They went to a cafe once during their stay in Kjellerup, and it was the only such occasion during their years in Denmark. I was born on February 6, 1926 at 1 a.m. (actually 9 p.m., February 5, Atlantic Standard Time). The momentous event occurred at home, in the bed my parents shared. I was restless that first night, and would sleep only on Dad’s stomach. He did not get much rest. I was small at birth and hungry, and Mother seemed not to have enough milk of her own to satisfy me, so I was soon given other food. It must have been difficult for Mother, moving to Kjellerup where she knew no one, becoming pregnant immediately upon her marriage, and giving birth at a distance from friends and relatives. Cars and telephones were nonexistent as far as we were concerned. There wasn’t even a Methodist church or a Methodist family in Kjellerup. But she had Dad and they were in love. months to move to a vacant position as foreman. 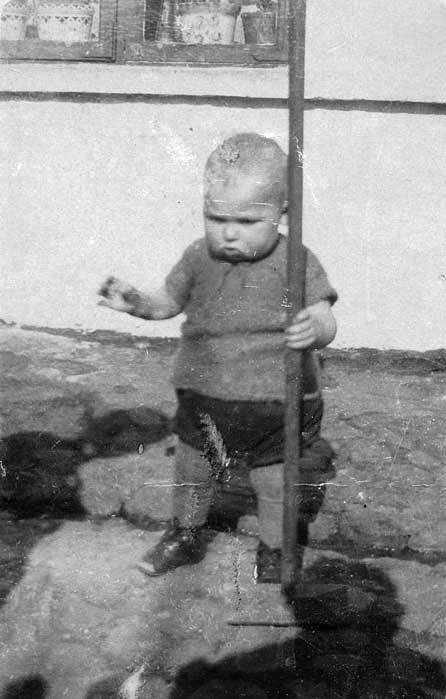 In late 1926 Dad started work on the track. But the foreman’s job was given to a son-in-law of the previous foreman, and after six months Dad’s labouring job was no more. Meanwhile we had moved to Rønne, to an old house where the floors were made of brick tile. We had a living room and an alcove downstairs and one room above. Outside was an open drain; one day I discovered a small piece of rope and, imitating Dad, dipped it in the dirty water and pretended to shave with it. Dad went back to the insurance business but the inspector who was his superior made the job intolerable, and after a year we moved to Neksø and occupied an upstairs room in Onkel Jens and Faster Hansine’s house. Our kitchen was a board placed across two chairs in the hall. Hard times were upon us, as the depression struck Denmark before it reached Canada. Dad worked one summer driving a milk wagon. Then he found work repairing the local Methodist church and shovelling snow for the town. The snow was particularly deep that winter and there were no snow plows. Alfred’s wife Hansine spent some months in hospital with her back problem, and Mother kept house for Alfred and looked after their three children. Bedstefar Holm recognized in Mother a fellow sufferer from mobility problems, and gave her money for a bicycle so she could get around. I spent considerable time with those grandparents, and Bedstefar with his crippled legs crawled around on the floor with me on his back. He was in his sixties at the time. I was quieter and less rambunctious than most of their grandchildren, so tended to be appreciated more than the others. Mother was deeply impressed by the kindness of the Holm relatives and through the years has remarked many times on the love with which they accepted her into the family. She felt inferior because of her frailty and her inability to work in the fields with Dad’s mother and sisters and sisters-in-law. She also felt she had been instrumental in causing Dad to terminate his course toward the ministry, and thought the family might hold that against her. My cousin Hans Conrad was surprised many years later when I told him of this reaction on her part, and said that the family recognized quality in her and in her marriage to Dad. It seemed that within the family she and Dad were the couple held in the greatest esteem, and they were thought to be almost as unique as Bedstemor Holm. High praise indeed.